Colorful public recycling bins in Hong Kong. Solving the plastic waste issue will require unprecedented levels of investment, novel partnerships and accelerated innovation — the kind that harness free-market forces and scalable solutions as powerful engines of growth. A circular economy for plastics demands new business models and innovation to truly transform consumer packaged goods from "consume and dispose" to "consume and collect." Below, I delve into each of these strategies and explore specific examples of how innovation, new business models and cross-value chain partnerships are hard at work. It’s essential that these examples and others are explored, tested, quantified and — if viable — scaled for rapid adoption. The global polypropylene (PP) market is on track to reach $133.3 billion by 2023, according to Transparency Market research. But PP — used widely in a range of applications, from kitchenware to medical equipment — is one of the least-recycled plastics, at a rate below 1 percent for post-consumer recovery. Until now, the low volume, low quality and relatively high cost of recycled polypropylene have been barriers to its use, and it is usually down-cycled into utilitarian, low-value items. 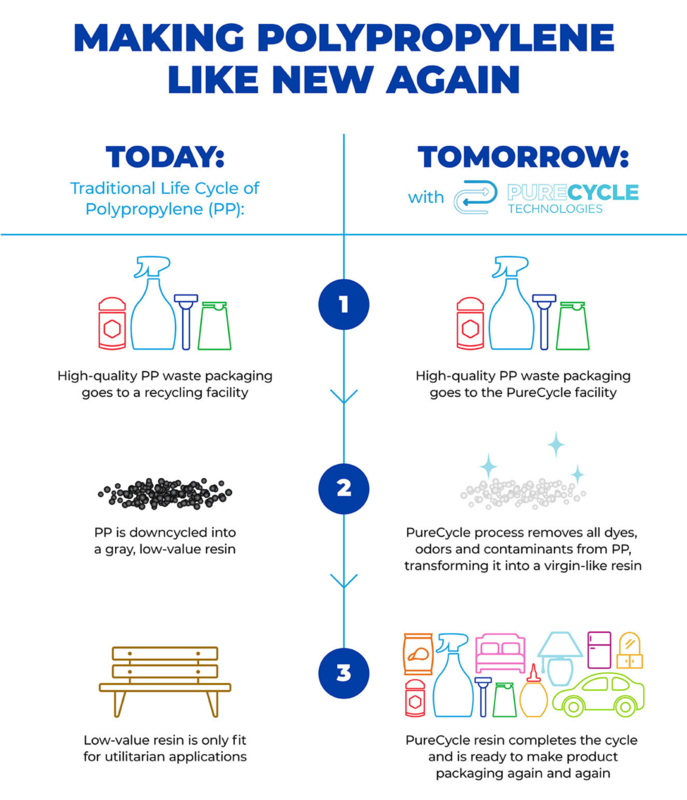 A Procter and Gamble (P&G) scientist has invented a breakthrough technology that removes color, odor and contaminants from used polypropylene, readying it for restoration to ultra-pure recycled resin with no trade-offs. To drive scale, P&G licensed the technology to PureCycle Technologies, which is completing construction of its feedstock evaluation unit and plans to open a production plant in Ohio in 2020. This innovation represents potential for billions of pounds of high-quality recycled polypropylene to replace virgin materials for P&G and many other companies. Several promising pilots are underway to test the viability of reusable packages and the business models behind them that collect, refill and reuse containers. Imagine if the on-the-go refillable microchipped bottles could be scaled across soda machines and brands. Here’s an out-of-home example: Lisa Foster, sustainable packaging manager at Coca-Cola European Partners, recently described a pilot underway at the University of Reading in the United Kingdom, where they introduced Coca-Cola Freestyle machines. Staff and students can purchase a refillable bottle, microchipped to make it recognizable upon each use. The user can preload the bottle with credit to easily and conveniently refill it with drinks; the credit on the bottle ensures it will be reused. This has the potential to dramatically shift consumer habits, especially if industry can align on technology and incentives to operate across competing brands. Imagine if the on-the-go refillable microchipped bottle schemes could be scaled across soda machines and brands, such that the consumer is rewarded for frequent re-use. Another pilot soon to get underway is Loop, an at-home reusable, refillable business model for consumer packaged goods (CPG) that kicked off during the 2019 World Economic Forum Meeting. TerraCycle is working with many of the world’s biggest companies, moving their supply chains — everything from shampoo to ice cream — from disposable to durable packaging. Imagine if the world’s most popular consumer products could be ordered and delivered to your home, and when you’re finished using a product, its package is picked up, cleaned, replenished and returned to you. The creation of a high-functioning global market of recycled plastics is within reach but will require major cross-industry cooperation. Recycling rates and infrastructure vary significantly across countries, as do the various types of plastic materials and forms getting collected and reclaimed. For decades, many CPG manufacturers have been using recycled PET (polyethylene terephthalate) and HDPE (high-density polyethylene) in their packaging, as most facilities efficiently can sort PET packages, recycle the material and sell it back as PCR (post-consumer recycled material) to make the economics work. But other materials, such as flexible-film plastic, are not widely collected for recycling in all countries. The low weight of flexible packaging means a lot more packs need to be collected to meet current weight-based recycling targets, and many facilities lack the capability to sort and bale the material. Hence, the market for post-recycled flexible films is anemic. Smart and intelligent packaging solutions are opening up a range of opportunities for brands and retailers. Some of the most promising advances toward a step-change in the recyclability of flexible films are happening in Europe via a project called CEFLEX and in the United States with the Materials Recovery for the Future (MRFF) project. CEFLEX is a cross-industry group devoted to creating a sustainable business model for collecting, sorting and reprocessing post-consumer flexible-film packaging — including financially stable end-markets. MRFF has invested in equipment to recover and separate flexible film from curbside collection systems. It will be operational in nearly 300,000 households in Pennsylvania in the summer, testing how to optimize the flexible-film collection and recycling process, as well as the sorting and baling of the material for sale as PCR. Imagine if one day you simply could place all your food and household goods packaging in your recycling bin along with other recyclables — even the lightweight pouches, wrappers and packets — and know that they will be collected and turned into valuable material. It is entirely possible to introduce industry-wide technology that can track a package and effectively reward the consumer for proper post-use collection. Incentivizing behavior change is a must. Packages that contain higher levels of PCR should become irresistible. Smart and intelligent packaging solutions are opening up a range of opportunities for brands and retailers to better meet consumer needs. New technology is also providing solutions, such as NFC (near-field communications), which allow consumers to interact with packaging via their smartphones. P&G recently took a leadership role along with other companies and partners across the entire value chain to form a new, business-driven, results-oriented initiative that could have a lasting impact to step-change the economics and stop the flow of plastic into the environment. The Alliance to End Plastic Waste will invest $1.5 billion in solutions that cross governments, development finance, NGOs and more, beginning with areas in the Asia-Pacific region where plastic waste is often mismanaged. More importantly, these world-class companies are bringing their top talent — engineers, scientists, researchers — to complement the capital investment and to deliver solutions that will keep plastic in the supply chain and out of our environment. Advancing innovation and infrastructure, and creating end markets, will happen only if there is massive public-private partnership and collaboration across industries. Brands will play a key role in driving consumer demand and desire, while incentivizing participation. No single company is large enough to make significant advances alone, and there must be shared risk, shared commitment and shared investment to truly drive scale and unleash the circular economy of plastics.